End your evening meal with a rhubarb-sorbet or simply serve as a refreshing fruity-sorbet treat at anytime. This dessert is not ice-cream. Neither is it a gelato. It isnot a sherbet. Some people think these wonderful desserts are all the same but they aren't. They are frozen, but other than that, each are unique in their own way. 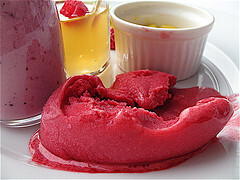 A sweetener and a fruit puree make up a sorbet. Any fruit can be used alone or in a combination of other fruits. The dessert is then slowly frozen. A sorbet is usually a vegan-sorbet. 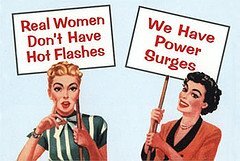 We hear that word so often lately. Vegan simply means that the recipe contains no animal fat at all. 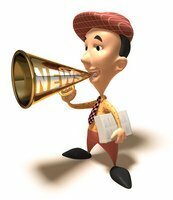 Therefore, the fat content tends to be very low. If honey is an ingredient, it is not truly vegan either. In some restaurants, it is apparently quite common to see a sorbet advertised as a "sorbetto" to purposely distinguish it from a gelato. A sorbet is softer and dense. It is not slushy or granular. The texture is evenly consistent. This low-fat dessert is derived from a sherbet and served mainly as a sweet dessert sweetened by honey or sugar. 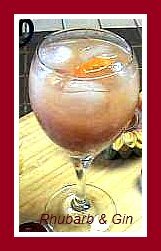 Alcohol can be added in some recipes if you wish, but it is not meant to be added to all sorbets. Though not fruits, chocolate and coffee are popular sorbet ingredients also. 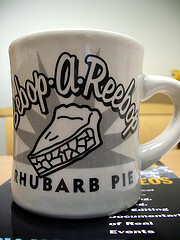 It's funny we refer to "fruits" being the main ingredient, when in fact, rhubarb is a vegetable, remember? 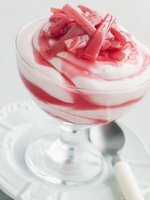 Not only does a sorbet serve as a dessert like a rhubarb-sorbet, but some are served with the specific intention of cleansing the palatte of your guests after their dinner. A Lemon sorbet is served with exactly this purpose in mind. Have you ever heard of a "savory sorbet?" This is served to actually compliment the main meal. Common ingredients with that objective in mind would be tomato, basil or beets. This is all quite amazing to know. I think for now I will stick to the fruity-sorbets. So, yet another thing you can do with all of that rhubarb from your garden. Try a rhubarb-sorbet, and remember to serve in small scoops. Because of the intensive flavor, portions are kept small so as not to overwhelm. Trim and finely slice the rhubarb. Place in a saucepan on low to medium heat. Add the orange zest and and half of the honey. Cover and set aside for 3 hours. Cook the ingredients stirring occasionally until the rhubarb is very tender and all ingredients are well mixed. Let cool for 10 minutes, and add the remaining honey. When cooled enough, puree in a blender. Pour the mixture into a suitable container for the freezer. When firm around the edges, give the rhubarb mixture a stir. Continue mixing well, and put back into the freezer. Serve in small scoops. 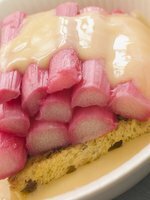 Over low heat, cook the rhubarb until very tender. This usually takes approximately 10 minutes. Let mixture cool. Add the sugar, and cook for 5 minutes. After the mixture has cooled, puree in a processor with the strawberries. Pour into a suitable freezer container and let freeze for 4 hours. Give the mixture a stir at this point, and puree again until smooth. Put back into the container and freeze again until served. 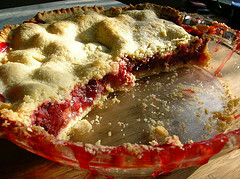 Combine the sugar and rhubarb and cook over medium heat until rhubarb is very tender. Let cool. Puree the strawberries, banana and cooled rhubarb mixture in a processor until smooth. Strain. 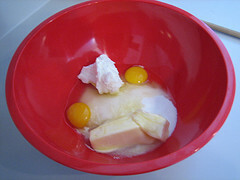 Mix the gelatin and orange juice separately in a bowl and let soften for 5 minutes. Warm the gelatin over low heat, and add the rhubarb puree. Add an additional 1/2 cup white sugar and stir until dissolved. Freeze for 5 hours. Serve in small scoops. Top with banana or strawberry garnish if you wish.